Piers’ edit: This is the first in a series of posts that Tracey and I came up with on a recent project trip to Melbourne – looking at how we can make even more environmental improvements at Gaia Resources. Introducing Gaia’s very groovy reusable coffee cups! 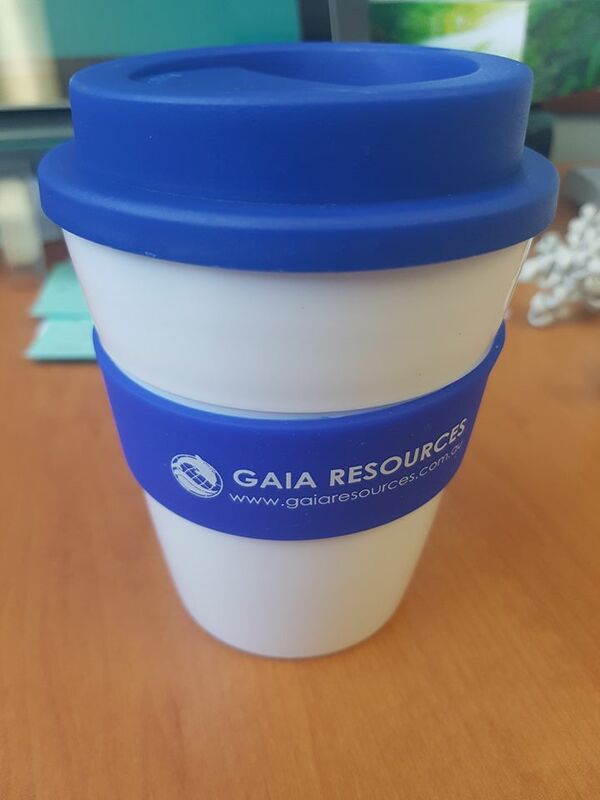 Given the average takeaway coffee consumption per capita at Gaia is high enough to keep the local cafes afloat, Piers made the decision to order these cups for the staff to reduce the company’s ecological footprint and promote a culture of reuse and sustainability. I’ve scoured the internet for stats on the impact of disposable coffee cups and to determine how many coffees it will take for our reusable ones to break even in terms of energy and resource use (and the sources I used are below). It is estimated that 500 billion disposable coffee cups are discarded into landfill every year around the world – that’s one million every minute of every day. In fact, half of the world’s plastic goes into products that are only used once, using water and energy to produce and creating a staggering amount of waste. Unfortunately, recycling does not solve this problem due to the resources required to manufacture the cups during each stage of their lifecycle, and the insufficiency of many recycling facilities to deal with contaminated food waste. Disposable cups also commonly contain a polyethylene lining and cannot be recycled, not to mention their polystyrene lids. There is the same amount of plastic in 20 disposable cups as one small reusable cup. It takes 15-20 cups of coffee for a reusable cup to break even with disposable cups. After that, you save water, energy and resources, and reduce landfill. Because most disposable cups are lined with plastic, they cannot actually be recycled, despite most people’s good intentions. Our reusable cups can be separated and recycled after three or more years of use, apart from the rubber band. So, after 15-20 cups of coffee the reusable cup breaks even. The average Gaia employee can achieve this within a day or two (kidding). For those wondering why Gaia didn’t opt for a non-plastic cup such as insulated metal, the answer is simply that our lovely plastic cups fit under a standard coffee machine spout. As a former barista this makes me happy – pouring coffee from one container to another will ruin its structure. Our reusable coffee cups are one of many initiatives we are taking to reduce our environmental footprint, and we’ll provide more details of these as we work our way through these initiatives.